PNY's Elite Portable SSD offers a storage capacity of up to 480GB in a pocket-sized design. This powerful USB 3.0-powered drive offers blazing-fast transfer speeds of up to 430MB/s*. It's the ideal solution for photographers, videographers, graphic designers or any mainstream computer user who needs to back-up or transfer large files. Take all of your data with you whenever you need it and have the ability to offload it quickly. 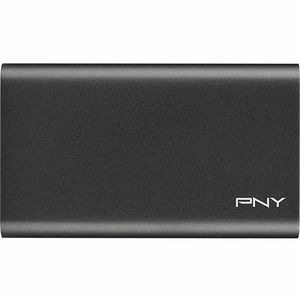 PNY Elite Portable SSD is small in size, but big in performance. Its ultra-compact design makes it incredibly easy to take your data with you anywhere on the go. With lightning fast read speeds up to 430MB/s and write speeds up to 400MB/s, the PNY Elite Portable SSD allows you to transfer large files in seconds. With the PNY Portable SSD you will experience fast and reliable performance compared to a traditional portable hard disk drive. PNY has been in the electronics manufacturing business for over 30 years specializing in computing and mobility products which are sold in 50+ countries around the world. Compatible with Windows and Mac OS X operating systems with the included USB 3.0 cable. PNY stands behind our products, our Portable SSDs are backed by a 3-Year warranty. Our US-based technical support team is available 24/7 to answer your questions.